Need help with a business case? Online performance review software that simplifies objective setting and performance appraisals for all involved. Focus and align your employees’ talent around company goals to give your whole company and everybody who works in it a performance boost. Configurable to support your process, PerformanceHub has many advanced features, yet keeps it simple, unobtrusive and easy to use. Objectives linked to the company’s in a navigable cascade. 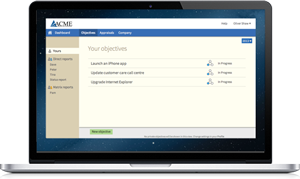 Configurable reviews with many optional features, including competencies and a flexible feedback system. Let PerformanceHub do the chasing for you, while you watch the real-time reports. Enable any combination of our advanced features. Your security assurance from us. ISO 27100 is the international standard for information security management. PerformanceHub online performance review software is built from the ground-up to help your company, and everyone in it, perform at their best. It covers the entire performance appraisal lifecycle, enabling you to create, track and review objectives from the CEO’s company goals all the way down to each employee’s personal objectives, linking everything together in an end-of-period performance review. No more chasing, emails, paper, Word, Excel or clunky out-dated interfaces. PerformanceHub keeps everything together in one place and does the chasing for you. It’s refreshingly easy to use, yet powerful enough to make a real impact. We built PerformanceHub to provide a tangible operational difference to your company. Employees can use it to help them plan and deliver, collecting performance review information along the way to ease the burden that old-school performance appraisals are saddled with. HR and managers get real-time reports, KPI tracking and unparalleled insight into employee performance to help them nurture talent. Performance reviews without the fuss. PerformanceHub is there to support you, not get in the way. Quickly and simply capture the performance review in PerformanceHub at any time, anywhere. Configure your appraisals to capture the information you need to support your process, including competency based and interim performance appraisals. When it’s time to do the performance appraisal, PerformanceHub has already captured lots of performance data along the way. Now reviews are a lot less onerous and less intrusive on daily operations, yet more than capable of making a real impact. PerformanceHub manages everything, ensuring that more reviews get done on time. Watch them roll-in in real time, and if anyone is holding up the process, PerformanceHub will point them out for managers or HR to give that extra bit of encouragement they might need. PerformanceHub captures data in real-time, so everyone knows exactly how people are performing and where they are in the process. Beautiful real-time charts give unparalleled insight into the performance of your company, tracking all KPIs from progress against company objectives and goals all the way down to individual performance. Slice and dice the data however you like. Want to find your top performers in India? No problem. Who isn’t performing in Sales? Which managers aren’t seeing eye-to-eye with their direct reports? Who is overstretched? Which competencies are most lacking in the organisation? PerformanceHub has you covered. 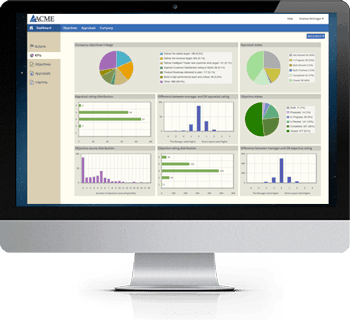 In short, PerformanceHub can be configured in many different ways to suit your needs. See our current PerformanceHub Features list and remember: we are always adding more. Our roadmap is driven by you. If you can’t see what you want, get in touch and we may build it for you at no extra cost. PerformanceHub – online performance review software built for the way you work. PerformanceHub is not just an appraisal management tool, but it also aligns our five locations around the world by coordinating objectives across the company as a whole – accessible anywhere at anytime. We get exceptional, first class support and remarkable cooperation. We’ve been working with Cogendo for about 4 months and have now established ourselves as an official partner. Cogendo are very open, approachable and receive feedback well (which often results in product enhancements). We really like PerformanceHub and what it has to offer a business and are more than happy to offer it to our client base. I have had really positive feedback from all staff about how simple it is to use. The flexibility of support from Cogendo and taking on board our suggestions has been quick polite and extremely supportive. Managers have said it is the best Performance Management system they have used and really like the tracking and cascading of objectives. It all flows and you can change amend as the objective is complete. The one to ones has been extremely popular with staff using in varying ways. All in all a wonderful success. I just need to ensure all staff will use it – this may take some time but will be worth it in the end. When we first considered purchasing Performance Hub the thought of moving away from our tried and trusted paper method, which I can’t believe we ever thought was effective, was very daunting. However, your excellent customer service and attention to detail has made implementing Performance Hub a pleasure. We’ve found Cogendo to be very accommodating and responsive to our needs both in terms of product development and operational support. Cogendo have also helped with internal comms, process development and training. Overall we have a great working relationship. We have introduced Performance hub into a major McDonalds Development licencee which they are using to drive their newly launched talent development programme across five countries. We have found the team at Cogendo to be exceptionally responsive to all our questions and support issues. From the demo on the website to a detailed training session with our full management team the information and support for implementing this system has been spot on! With a broad range of experience of carrying out appraisals within our management team we wanted a system that was user friendly and fit for purpose that we can build on as confidence within the team grows – PeformanceHub ticked all these boxes and is a system that people have virtually taken in their stride. We also have remote offices in America and China and we have been able to connect everybody up easily. Now we are up and running Congendo continues to be there at the end of a phone or email which is invaluable. I would not hesitate to recommend this system! Cost-effective, simple and effective system, straight forward set-up process, excellent level of on-going technical support provided by Cogendo; flexible system allowing us control over functionality – looking forward to the probation review function being added to the system and to further developments. Being able to review performance against actual deliverables is important to us, not only from a reward point of view, but it has also helped with engagement and retention. The fact that PerformanceHub works in real-time completely changes the landscape vs the usual performance management process.